‘Swarming’ has a rich and complex history in political and philosophical literatures. 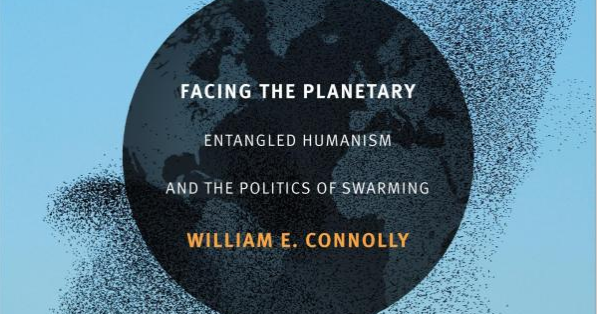 That history percolates in political theorist William Connolly’s recent book Facing the Planetary: Entangled Humanism and the Politics of Swarming in which he proposes a ‘Politics of Swarming,’ and even resonates in his writing style. The question of ‘swarming’ intersects poetics, politics and philosophy: here I shine a light on that intersection, and recommend that we approach the swarm with caution. Soon after the release of Multitude a harsh review appeared in the London Review of Books. Political theorist Tom Nairn criticized Hardt and Negri for giddily disregarding how dangerous denationalized networks of individuals can be, and for thereby rushing naïvely onto dangerous terrain. That terrain, he wrote, was ‘already occupied by fundamentalists of varying hues, all ready with their own formulae for rapture and ecstasy.’  Nairn was surely thinking partly of global terrorism, and Jacques Rancière made a similar point slightly later, tempering his support for Hardt and Negri’s ‘multitudes’ with the rhetorical question: ‘Did the Arab crowds applauding the Twin Towers carnage in the name of Allah constitute an example of the ‘multitudes’? 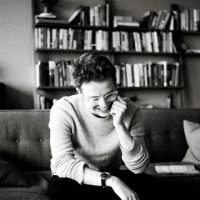 Are all multitudes ‘good’ or ‘true’ multitudes?’  But what was distinctive about Nairn’s critique — and what has made it, until this moment, truly unique — is that it connected Hardt and Negri’s enthusiasm about ‘multitudes’ to their style of writing. Identifying Hardt and Negri’s ‘odd style of religiosity,’ he reckons their ‘oracular tone is puzzling.’ For ‘if the outlook for global democratisation were as good as these prophets maintain,’ he reasons, ‘then surely a more empirical, matter-of-fact tone would suffice?’  Nairn’s complaint seems needlessly puritanical; in fact, it is the equivalent of saying “If you’re happy and you know it, then you’ve really no need to be clapping your hands.” But he does capture something very important: that ecstasy has a style. Indeed it does: and that style is closely tied to motifs of swarms. More specifically, I want to say that swarming is a writing style as well as a political ontology. Like Deleuze and Guattari before them, Hardt and Negri used the term ‘swarm’ to great effect. The ‘swarm’ is the figure of the connected multitudes, one that thrives on the distribution and differentiation of individuals while channeling its ‘Swarm Intelligence’ through intersecting networks. And to grasp the significance of Hardt and Negri’s rapturous style, we’ll need to have a long look at the poetics of swarming. Hardt and Negri themselves briefly refer to the poetics of swarming, footnoting Comp Lit Professor Kristin Ross’s excellent book on Arthur Rimbaud, the French nineteenth-century poet of the swarm. But by confining Rimbaud to one paragraph, Hardt and Negri manage to elide the really crucial thing about swarming. They call the poetry ‘beautiful,’ but refuse to mention its chaotic, intoxicating aspects. We must read Rimbaud as a slippage in Hardt and Negri’s text, crying out for us to chase the footnotes and find the poetry. For swarms in literature come to us random, chaotic, and unruly. What Rimbaud achieves, Ross shows, is not only ‘a crowd effect, the multiplication of voices,’ which Hardt and Negri can easily work with, but a radical ‘intoxication,’ ‘too much sensation,’ a disorienting overload that disperses ‘the body’s surface into a thousand microsensations.’  And although they don’t mention it, such intoxicated overload might even characterize Hardt and Negri’s own swarming style. So why must we return to ‘swarms’ now? The problem with an invisible network is just that: it is invisible. It is nice to think that when I do things ostensibly as an individual I am in fact acting with an ‘intelligent swarm’ that is making decisions in more sophisticated ways than my lone brain can muster. Me, the Pope and Naomi Klein, all solar-panelling our roofs — together! Who wouldn’t want that? Yay for swarms, I might say, and perhaps Pope Francis will be saying that too at this very moment. And yet there is also no proof that anything like this is taking place. Once again, Walter Pater, my personal favorite multilingual swarmer, is crucial here. It is all well and good to experience a ‘swarm of impressions;’ but what if, as Pater intoned, ‘Every one of those impressions is the impression of the individual in his isolation, each mind keeping as a solitary prisoner its own dream of a world’? Unsure of whether I am alone or with others, I dream my dream of swarms. It’s breathless stuff: litanies of rapture that literally culminate in everyone ‘dancing in the streets out of joy.’ Who knows: maybe social media can be the dynamic engine of a Sorelian general strike. It’s also possible that the 6,000 tweets posted in the average second just create a sensation of swarming, a swarm-effect, much like a litany of jargon or a line of Rimbaud: ‘the dispersion of the body’s surface into a thousand microsensations (“la peau leur fourmille”).’ The belief that individual acts (clicks, posts, shares) form part of a swarm decisionality, with an intelligent inner logic, requires a level of almost spiritual conviction that you aren’t merely furnishing your lonely dream of a world. Is that conviction warranted? Are you engaged in collective swarm-action, or just personally experiencing a swarm-effect? The point is that you can’t exactly know. And that’s also the problem. None of this is a reason to reject the ‘swarm’ outright. Connolly’s new book is illuminative, informative and at times genuinely motivating: you should read it. Nonetheless, we should approach the ‘swarm’ motif with caution, even if only because we know how seductive it can be. How can we act and live together, when we must also be apart? This is one of the most difficult and profound questions we might ask ourselves. And we must think critically, historically and literarily about how we are going to approach it. Nairn, T., 2005. ‘Make for the Boondocks.’ In: London Review of Books 27.9. Rancière, J. 2010. Dissensus: On Politics and Aesthetics. Translated from French by S. Corcoran. New York, NY: Continuum. p.89. Hardt, M. and Negri, A., 2004. Multitude: War and Democracy in the Age of Empire. New York, NY: Penguin. pp.91-93. Ross, K., 1988. The Emergence of Social Space. Minneapolis, MN: University of Minnesota Press. p.105, p.112. F.C. Beiser ed., 1987. The Fate of Reason: German Philosophy from Kant to Fichte. Translated from German by H.B. Nisbet. Cambridge, MA: Harvard University Press. p.119. La Vopa, A.J., 1997. ‘The Philosopher and the “Schwärmer”: On the Career of a German Epithet from Luther to Kant.’ In: Huntingdon Library Quarterly 60.1. pp.85-115. Midelfort, H.C.E., 1999. ‘Madness and the Millennium at Münster, 1534-1535.’ In: C. Kleinhenz and F. LeMoine eds., 1999. Fearful Hope: Approaching the New Millennium. Madison, WI: University of Wisconsin Press. pp.115-134. Porteous, R., 2016. ‘Schwärmerei: Walter Pater and the Case of the Disappearing Swarm.’ In: Studies in Walter Pater and Aestheticism 1.1. pp.23-40. Connolly, W.E., 2017. Facing the Planetary: Entangled Humanism and the Politics of Swarming . Durham, NC: Duke University Press. p.143. Pater, W.H., 2010. Studies in the History of the Renaissance. Oxford: Oxford University Press. p.119. Richard Porteous is a Ph.D. candidate in English at New York University. Richard is a Ph.D. candidate in English at New York University.